With over 50 years combined experience in the building trade, the team at BG Home Improvements Ltd. are well equipped to handle a range of building projects in Manchester and the surrounding areas. We have perfected our skills over our years of service in the trade and are dedicated to providing quality workmanship and excellent customer service. 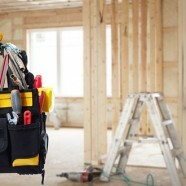 Our highly skilled team of tradesmen have established a reputation to be proud of as respected builders in Manchester and the surrounding areas. Undertaking a projects for both domestic and commercial clients, we can help with your building job, no matter how big or small.